The other night, my mother and I spent a lovely evening together - having dinner at Bangkok Thai (more on that at a later date) - followed by one of the best cooking classes I've ever been to at the Woodmere Whole Foods. It was called Vegan and Raw and featured three different summer bean salads. Now, I'm a lifelong vegetarian, and despite the fact that they're one of my food staples, the thought of beans isn't normally all that exciting to me. But after taking this cooking class, I'll never feel the same way about them again. We arrived at the store to learn that we were the only two people signed up for the class. It surprised me since the classes at the Cedar Center store, where I normally shop, tend to sell out so quickly. But we were still excited to be there, but a little hesitant about being the only two people in the class. Once we met the instructor - David Moss - and his assistant - Nadine - all that changed. From the instant we said "hello" David and Nadine were so personable and knowledgeable. I knew it was going to be a great class. 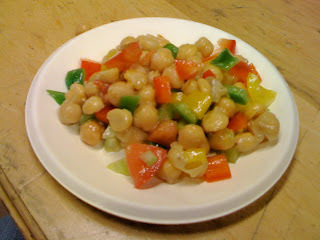 The class started out with a garbanzo bean salad, made with celery, tomato, red pepper, yellow pepper, and green pepper. It was tossed with an extremely simple dressing made out of flax seed oil, lemon juice, olive oil, and a little bit of salt and pepper. Obviously, since this was a raw salad, everything was fresh and flavorful, but despite the simplicity of the dish, it popped with so many flavors. 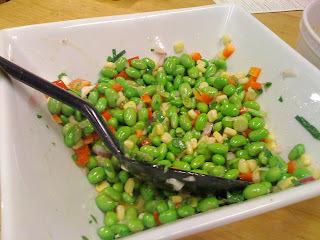 The next dish - my favorite of the evening - was an edamame salad, made with corn, red pepper, green onion, red onion, Italian parsley, and oregano. It was tossed with a dressing made of lemon juice, Dijon mustard, olive oil, and salt and pepper. I'd honestly never thought to put Dijon mustard with edamame, and I really couldn't believe how well all of the flavors worked together. 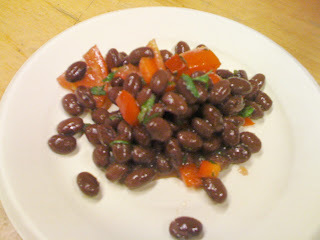 The final salad of the evening was a black bean salad. Again, it was made with simple ingredients - beans, tomatoes, serrano chile peppers, red bell pepper, cilantro, white wine vinegar, olive oil, and salt - but had such a complex flavor. As my mother said, this, or any of the other salads could be used in so many ways - in their salad form, or in a wrap, in pita...the list could go on and on. This class has made me want to seriously look into finding other vegan and raw recipes to try out at home. I didn't really realize how simple (and delicious) raw cooking can be. If you're interested in learning more about vegan or vegetarian cooking, the Woodmere Whole Foods holds a class monthly featuring different vegan or vegetarian dishes. The next class is scheduled for Wednesday, August 26, at 7:00 pm. There's a nominal fee to take the class - $5 - but for the samples you get and the knowledge that the instructors have, it's completely worth it. The Cedar Center Whole Foods store also has a neat series called Quest For Cooking - where different local chefs come into Whole Foods, purchase various ingredients, and then whip up a meal before your very eyes. Although not specifically vegetarian or vegan, these classes seem great for anyone interested in the Cleveland food scene.